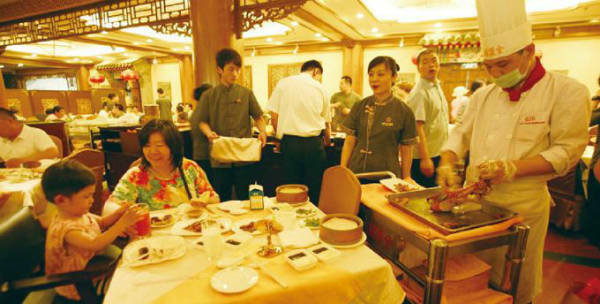 China forbids catering operators to set minimum consumption according to Catering Industry Operation & Management Regulations (Trial) released by China Ministry of Commerce. The new regulation is welcomed by consumers. It reminds operators to consider consumers’ interest rather than ignoring them by requiring minimum spend. The regulation strictly points that, catering operators should clearly state promotion details including reasons, ways, rules, valid period, range of promotion items as well as relative restrictions. Catering operators should guide consumers to order appropriate amount of food amount and be proactive packing leftover of dishes for consumers. Besides, operators can award to consumers who practice saving behaviors whenddddd dining according to the Regulation. China encourages catering operators to develop popularized catering like one with special favor or element, fast food and breakfast, which can provide standardized dishes to let consumers service themselves. Catering operators, who provide take out service, should establish detailed service flow which clearly states service time, range and charge standard. Operators should choose proper transportation to deliver food to consumers on time. Such Regulation is due to be carried out on 1 November 2014 in China. In 2013, total transaction value of China online food ordering market exceeded RMB50.26 billion ($8.18 billion) and it is estimated to reach RMB85.04 billion ($13.85 billion) in 2014 according to data from iiMedia Research. Cecilia is a writer at CIW, graduated from Nanjing Normal University, majored in English. In her leisure time, she enjoys reading books and doing yoga.